Coming back to the class 455/9, the unit will be numbered (45)5907. 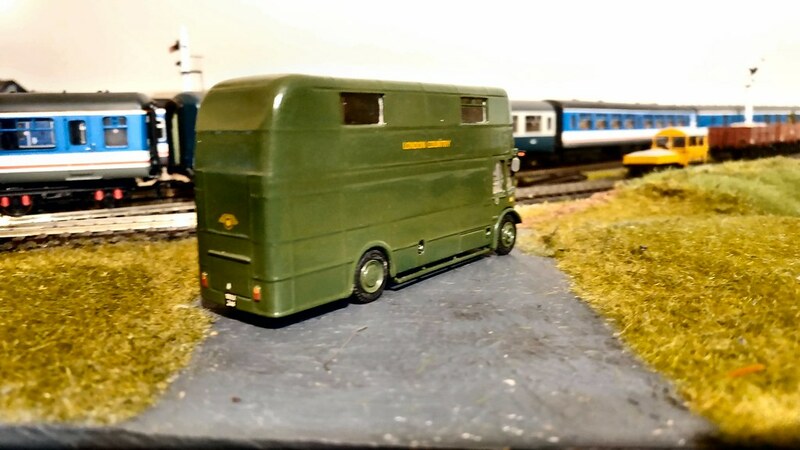 I have made a little further progress on adding the vinyls, this time to the Motor Brake Standard Open (MBSO), and in matching the blue on the Driving Trailer. There is some work involved in finishing these off and correcting a few errors in the vinyls, but overall the vinyl overlays take a lot of the hard work out of adding the livery elements and details. Note that the DTS is leaning a bit in the pics because it isn't sitting properly on its chassis at present. 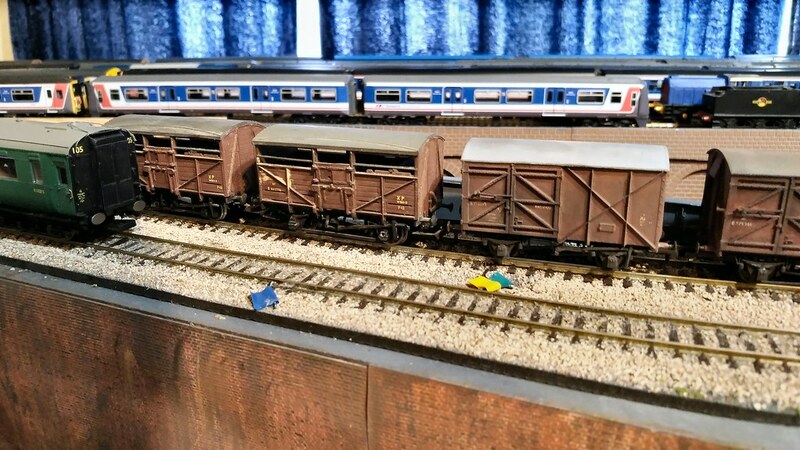 Also on the workbench are a couple of positively ancient Airfix cattle wagons, built when I was teenager. They had crudely added Triang metal couplings, and had lost the odd buffer, but otherwise were basically intact. The first thing was to replace the old plastic wheels with metal ones, but they didn't want to roll freely at all, so I drilled out the axle boxes and put brass bearings in, with little improvement. Next, I tried reducing the length of the axles slightly, using a drill and file to turn them down a bit; this was a little better but they are still stiffer than is really desirable. I replaced the missing buffers with approximations from the spares boxes (a few real wagons could, and did run sometimes with odd buffers). I replaced a missing coupling with a Parkside NEM adapter and Bachmann coupling, something I'll do with the rest of the couplings if or when I can get the wagons to run properly. The photos show them in pretty well the finish I achieved when I built them all those years ago. 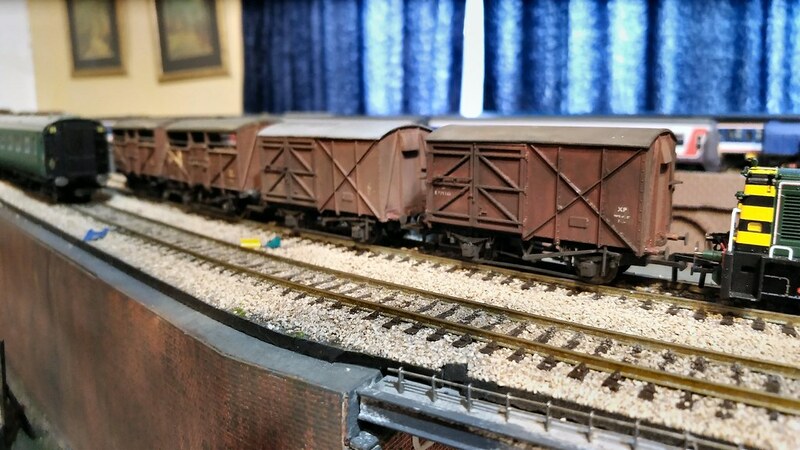 Also in the photos are the two Parkside Palvans I built a week or two ago, with just a tad more weathering applied. Staying on the thread Kevin. Jeff that 455 is starting to look good. I commute to work on them these days and they form an integral part of work being a dispatcher at Clapham Junction. The 455s are a mixed bag as are their AC contemporaries the 317s. The first batch (class 455/8) has a committee-designed front end with warning horns mounted on the roof either side of the gangways. The second batch, class 455/7, are hybrids in true Southern tradition containing one trailer of the class 508 units they replaced which has a completely different profile. The final batch, class 455/9, are similar to the /8s but have four matched vehicles and, as with the /8s, their warning horns are paired below the frames under the driver’s window. Two have accident-losses replaced by coaches rebuilt from the prototype class 210 DEMU though apart from the 67xxx carriage number the extent of work done makes them indistinguishable. All were delivered in BR blue/grey and went on to wear NSE stripes. The majority have always been South Western units with just some of the 455/8s running Central services. Therefore upon full privatisation most of them went to South West Trains where they carry the bright red “Metro” livery. Those /8s which had been based at Selhurst instead of Wimbledon became Southern units wearing their ivory and green scheme. All have been refurbished internally though the SWT ones had much more work done. This included replacing the high-back 3+2 seating with somewhat more comfortable 2+2. SWR units have also had their traction equipment replaced with Vossloh-Kiepe kit in the past two to three years. Southern units retain their original interior and traction gear but have had the end gangways plated over. The 2-car class 456 units were ordered by BR but delivered to NSE for South Central services. 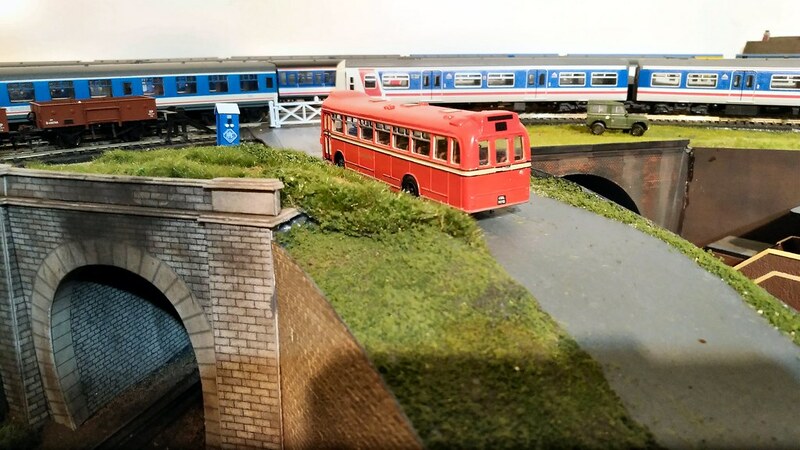 The intention was to boost some busy services to 10-car but the necessary signalling and platform works were never completed. Instead they spent most of their lives as unloved oddities sometimes coupled in pairs with or without a 455/8 and always singly on the late-lamented South London (Victoria - London Bridge via Peckham Rye) service which had been the very first “Southern” route worked by electric trains. As part of the privatised rolling stock procurement process Southern received 5-car class 377/6 units which resulted in the 456 being surplus. They were snapped up by SWT who managed to get Network Rail to adapt their platforms and signalling for 10-car operation including the complete shut-down of Waterloo for several weeks. Until SWT was ready for 10-car operation they ran in pairs with a 455 on Waterloo-Woking stoppers. Since then they have run attached to pairs of 455s to make 10-car trains where required. The intention is that all trains arriving at Waterloo between 08.00-09.00 and leaving between 17.00-18.00 will be 10-car with as many more as possible also strengthened. It doesn’t always work out like that. Upon transfer to SWT the 456s were internally rebuilt to match the 455s which included removal of the (never-used) toilets. This gives rise to a large blank panel with a small square window where the toilet used to be though which is now a seating area. They were built without end gangways which does not match the 455s probably because they were an add-on order to what ever BREL was building at the time in York (321s?) so they came off the same jig. SWR took over the franchise last year in what was regarded as a surprise move. Since then they have been incredibly slow at applying their own branding. It took some six months before vinyl overlays replaced South West Trains with South Western Railway. The new livery was launched on unit 444040 some eight months into the franchise but this unit has since vanished after only a few days in service. 450111 also wears the new colours and is the only electric unit to do so after well over a year. Some of the class 158 and 159 diesel units have been reliveried though no two are the same. Differences include white or yellow first class stripes, or none, with white, yellow of differing widths or no relief band above the sole bar. Early repaints have a definite dark grey base colour but later ones have this changed to a bluey-grey sometimes referred to as steel blue. Several class 450 units have new charcoal coloured seating instead of red including 450111 but none of the diesel units is so fitted. Most recently 159007 has appeared with only the darker grey areas in the stripey vinyl but the pale areas in a much lighter shade than are the vinyls and applied using paint without the reflective stripes. 159009 has now appeared in all paint with an even lighter shade of pale grey and something akin to the bluey-grey at the ends. It all looks a mess and smacks of indecision, lack of money any direction. The shade of yellow used on repainted unuts is much paler than standard warning yellow. To match the trains staff uniform has yet to be issued in SWR colours other than ties, some hi-viz wear and beanie-hats. The 455 and 456 units have a short life with new class 701 units due to replace them from 2019 onwards so it makes no sense to repaint them. 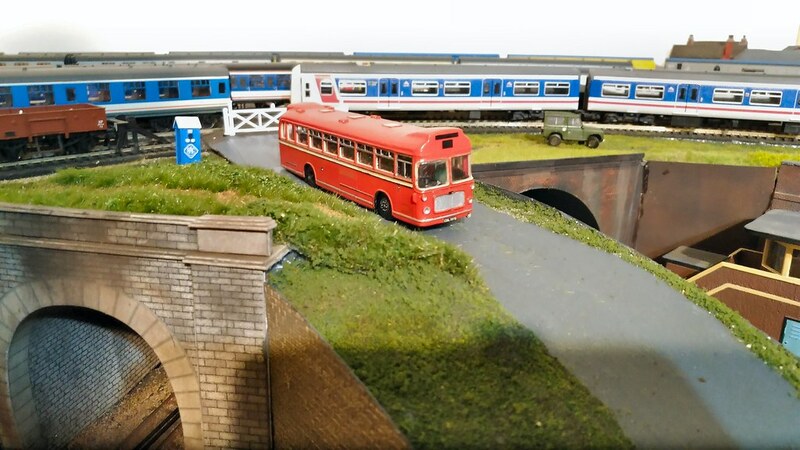 The blue-livery “Suburban” class 458 is also expected to depart when the 701s arrive. This leaves a substantial fleet of blue class 450 and the white “Main Line” class 444 plus the diesel units to be reliveried yet no effort appears to be made in this direction. 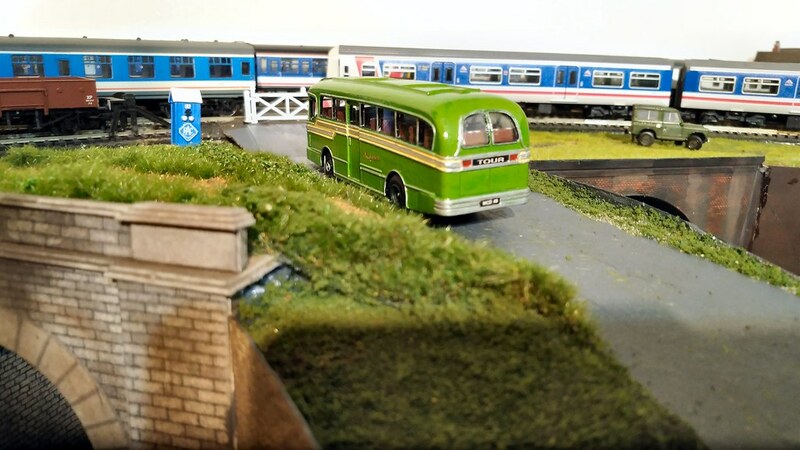 The class 442 units are due to return in December wearing which ever version of two-tone grey the painter has been told to apply. There is lunch-room speculation that Stagecoach are unhappy about their colour scheme and branding being still in general use. It is normal for an outgoing franchisee to be required to de-brand (but not repaint) their rolling stock by the time they return the keys. It was noticeable that this did not occur at the SWT/SWR handover. Class 455 and 456 form the backbone of South Western metro services from London Waterloo via the main line to Hampton Court, Chessington South, Shepperton, Guildford via Woking, Cobbam or Epsom, Dorking via Epsom and some Kingston Roundabout duties. Their appearance on the Windsor Lines is now largely confined to the Kingston Roundabout trains as classes 458 and 707 cover most duties. Southern use class 455/8 units on some London Bridge trains including those to Victoria via Crystal Palace but their use to and from Victoria otherwise is confined to some peak hour Caterham turns. Hi Kevin. Yes, the class 456 units had the later,more stylish front end with no gangways, but could be, and were, used with the class 455s in multiple. 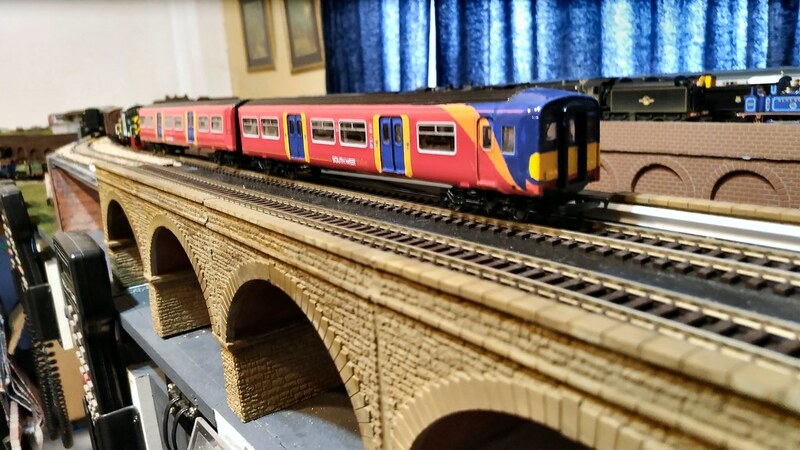 My 456 unit in the photo is unpowered, as the Replica Railways motorised chassis in the class 455/8 attached to it is more than powerful enough to take itself and five coaches around. The 455/8 has the ugly front end designed by committee, and universally condemned by the railway press at the time they came out. It was so poorly 'designed' that the jumper cables partly obscured the unit numbers and lights. It seemed a bit of an anomaly that the only toilet in a six or ten car set (one or two class 455s plus a 456) was in the two-car unit with no access from the rest of the train which had no toilets at all. I haven't yet added the jumper cables and ugly mounting boxes on the ends of the 456. See also Rick's very detailed description above. Thanks both for the compliments. I have another rather unexpected addition to my industrial loco stud. 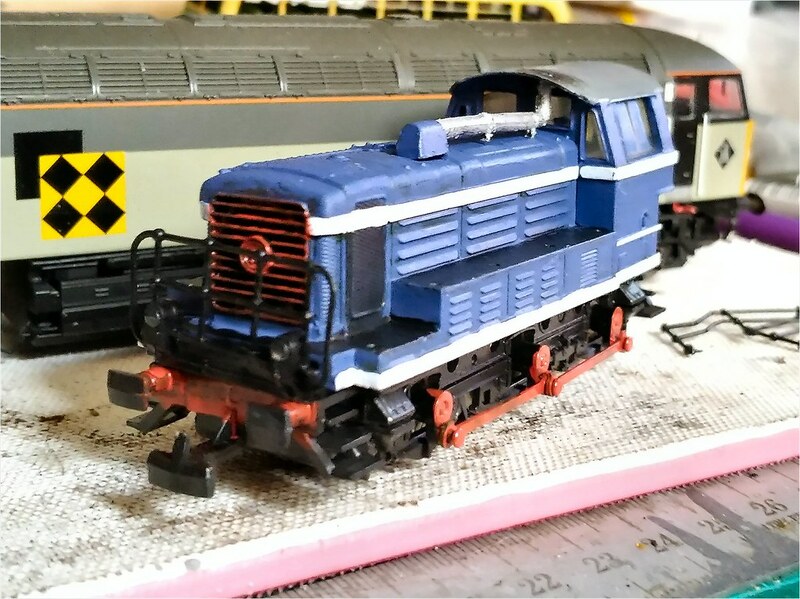 I bought a quite old Jouef SNCF C61000 outside framed 0-6-0 diesel shunter, which runs smoothly enough at low speeds but had a little bit of dry-bearing shriek (easily fixed with a bit of oil and some running). It came in a dark green with yellow stripes, but I have been painting it into a fictional scheme more in keeping with some of my other industrials; French blue with white bands, and red buffer beams, coupling rods, cranks and radiator grille. I cleaned up the glazing with some T-cut while I had it apart. I have also removed the side railings to ease painting, but I think it may look a little more Anglicised if I leave those off. Once I am happy with the running, I'll have to shoehorn a decoder into it. I'll also have to do something about the couplings, as this one pre-dates the change to NEM pockets. Thanks Kevin. I regret to announce that I ran out of storage space a long time ago, while still adding to my collection even now! My latest experiment with sound is to try out a Soundtraxx Econami decoder with UK diesel sounds. I have fitted it to a Bachmann Ivatt 10001 diesel, with a 28mm round speaker. This particular speaker is only rated at 1w but I have the volume turned down; even so, it emits the occasional pop, so I will need to fit a better speaker once I can find one of the right size. The Econami decoder is rated for 8 ohm 2 watt speakers. I do have a few suitably rated speakers but they are all too deep to fit the Bachmann body/chassis clearances. The sound from this decoder is not too bad. 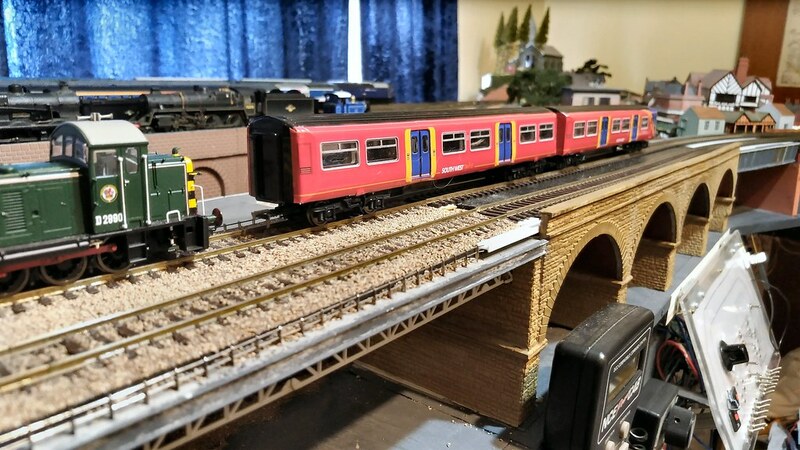 I tried out each of the sound sets in turn: class 20 (default), class 31, class 37, class 47, class 66 and Derby Lightweight DMU. The last one sounds good but seems to lack any gear changes so immediately fails on that score - I won't be buying any of these decoders to fit into any of my DMUs. The rest are good, but for 10000/10001, I couldn't decide between the class 31 and the class 37 sounds, with both having 12 cylinder EE Co engines, whereas the Ivatt duo had early versions of the 16 cylinder engines. Both sets of sounds are reasonable substitutes for a type that has no prototype recordings to work from. I think the class 31 horn sounds fit my idea of what 10001 should sound like - one tone only needed. 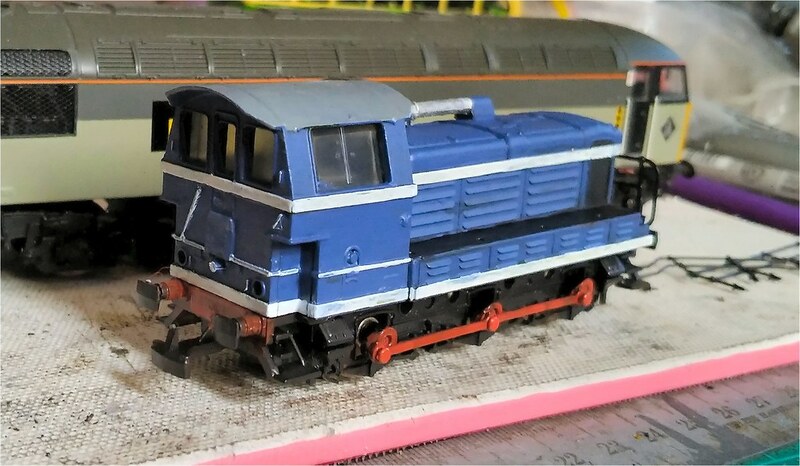 Anyway, so far I think the Econami is promising as a lower priced sound decoder, with more features and adaptability than the even less expensive Hornby TTS decoders. My initial trials with the speaker outside the chassis and no sound chamber resulted in a slightly tinny sound overall, but once I sealed the speaker into the aperture in 10001's body with some black-tack, and actually placed the body onto its chassis, the sound was very loud and had to have the volume reduced (master volume on CV128 and horn volume on CV129). I will strongly consider buying two more diesel versions, to fit into my Heljan Lion (8-pin - class 47 sounds but different horns), and the other Bachmann Ivatt (10000) in my stocks to enable easy operation as a matched pair. A quick scout of the Internet found a rear shot of 581 J (ex-RLH 44), revealing the rear number plate is wrong in the photo, and should have been a straight 1-line version rather than a 2-line one. I have replaced it now. 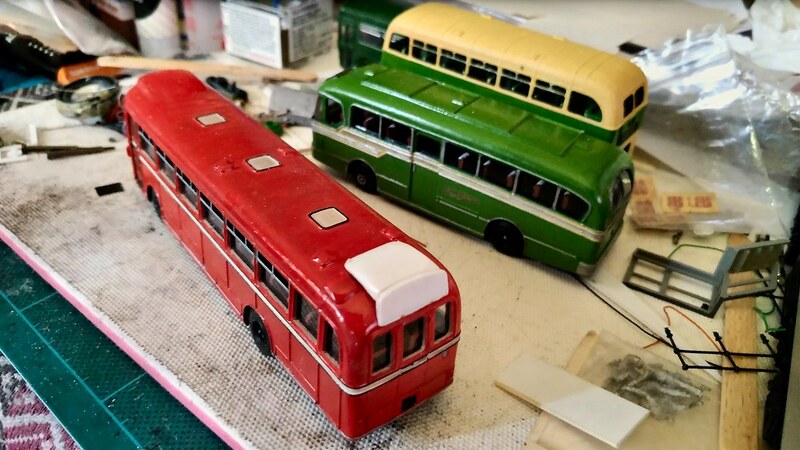 The two Southdown buses have been sitting on the workbench for a lot longer, but I have now got around to tidying up the paintwork (still a little bit to do) before adding glazing as the next step. 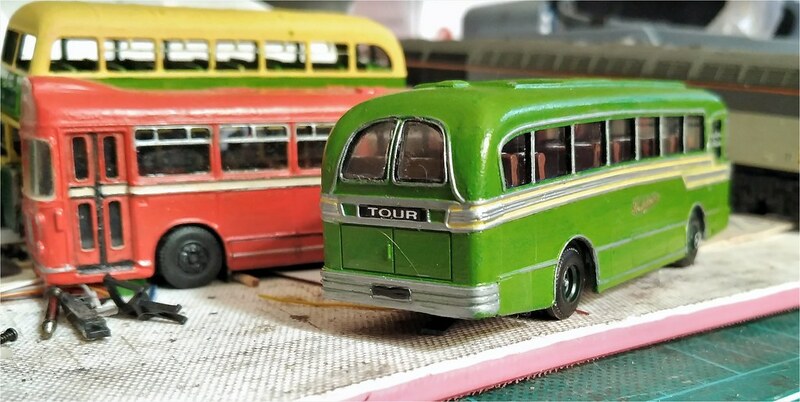 Work continues on the Little Bus Company Southdown Duple Coronation Ambassador kit. 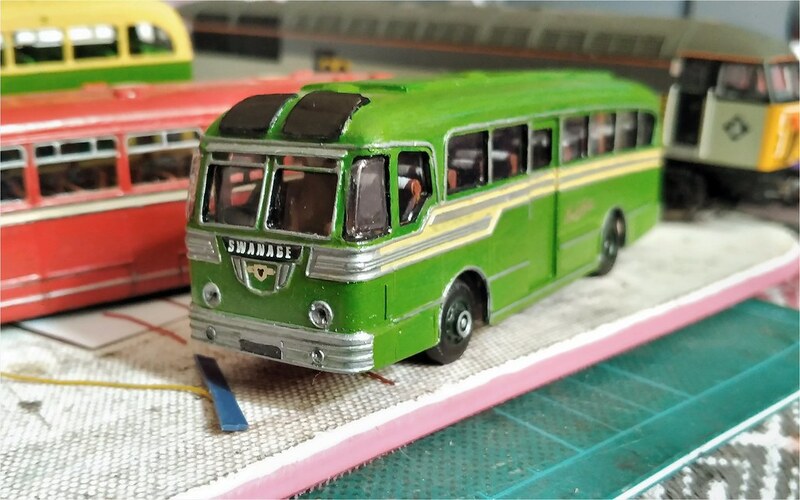 All that remains to be done now is to paint on the tail lights, print and fix some registration numbers (probably MCD 46), fix up the poorly fitted corner windscreens (the close-up photo cruelly shows them as looking really bad! ), and give the model a good coat of varnish. It looks like it will be ready to enter in the competition on Sunday 2nd December. I'm just working on another unfinished project, a Bristol RELL that I have been doing as a Thames Valley vehicle. Unfortunately for me, the TV REs had tall destination boxes at both ends, although when I started this model, I hadn't realised the back end had this feature as well. 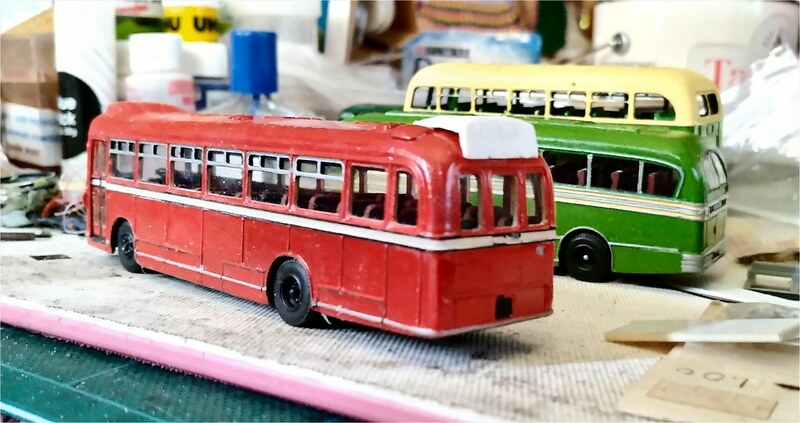 Anyway, thanks to some very helpful modellers in the Model Bus Federation Facebook group, I have a couple of photos and a set of blueprints to work from now, so work commenced with some thick plastic sheet, laminated for the main body and heavily filed to blend into the roof curves. The next stage will be to use some filler, then a lot more filing, before painting it to match back in. Hi Kevin. The answer is "Yes" to both questions. The rail replacement bus is more 'modern era' though. 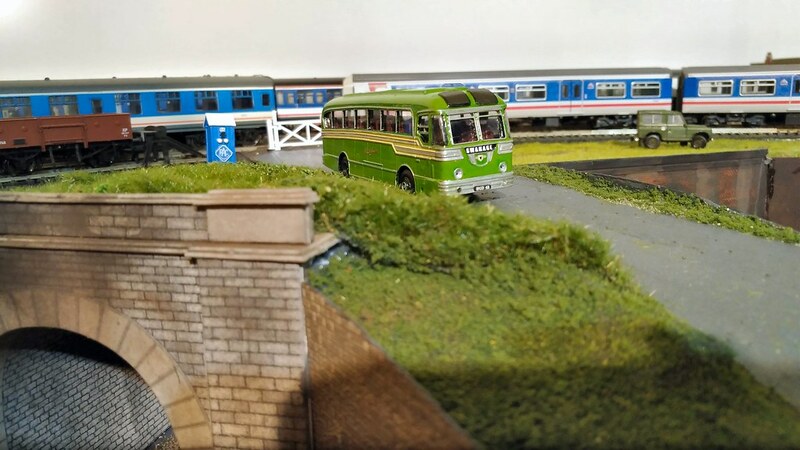 The Southdown Leyland/Duple coach and the ex-RLH uniform store got first prizes in their categories last week. 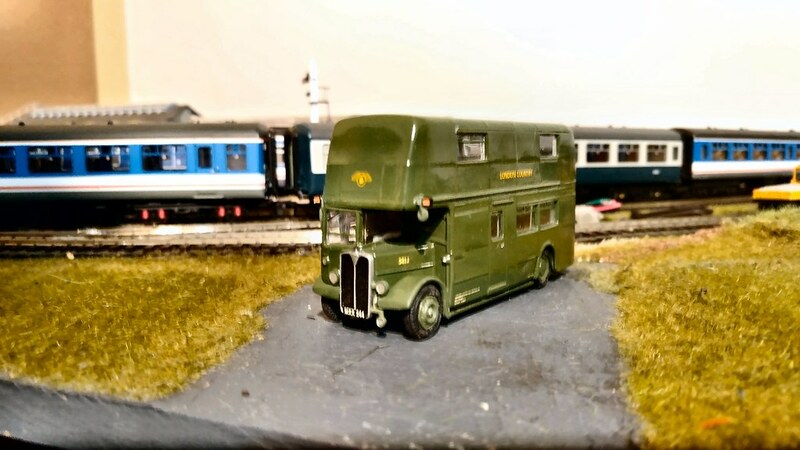 The finished RLH was shown before, but I never posted the photos of the finished Southdown coach or the Bristol RELL, so here they are. The Bristol was never quite right and needed a tad more work done on it, but I ran out of time. 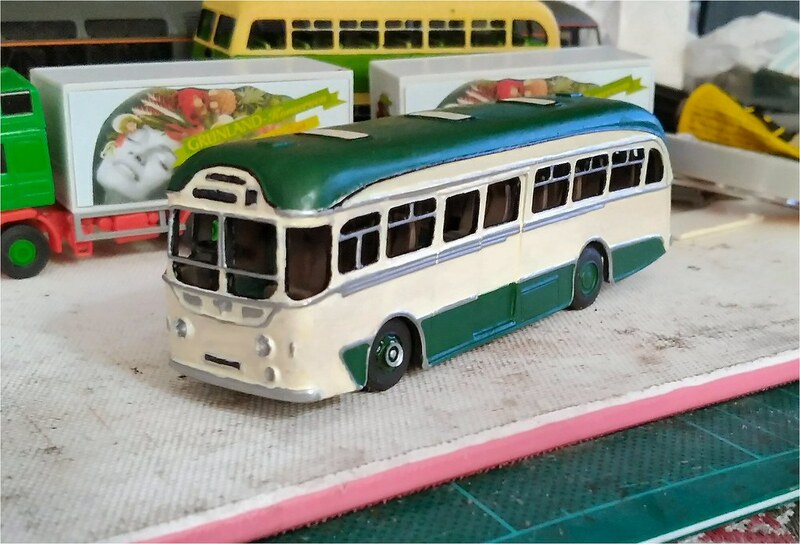 Continuing on with non-railway items, I have picked up on another bus kit started over a year ago but languishing on the workbench; another Little Bus Company resin kit, this time an AEC Regal IV with Harrington Wayfarer II bodywork, as used by Maidstone & District. It is getting close to the glazing stage, but I am still to-ing and fro-ing a bit with fine paintbrushes and the cream and green paints, as well as the silver and black fine lining on the raised trim. 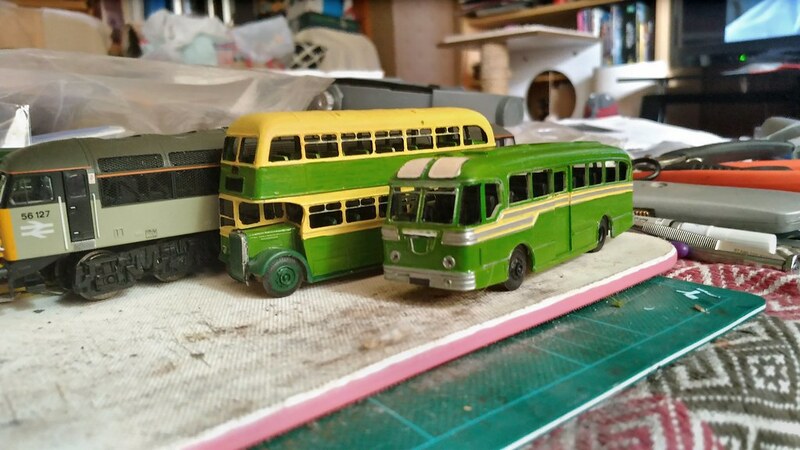 I have used BR multi-unit stock green for the green on this bus, and Humbrol #41, ivory for the cream. I think it should be slightly more yellow in tint, but they did tend to fade a bit. 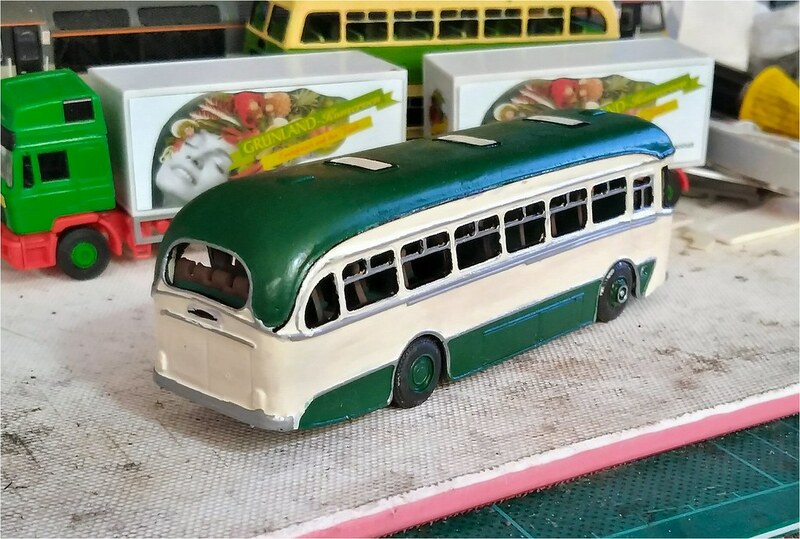 As with most of the other buses I build, painting the black inside the window rebates to disguise the depth a bit is a right royal pain to do, but well worth the effort for the improvement in the appearance of the finished result.